Hunt says we overvalue our differences. We should spend more time realizing our similarities. About a month and a half ago, I had the opportunity to go floating. Floating is a type of therapy that’s rooted in sensory deprivation. Essentially, you get into a pitch-black tank that’s about 3/4 the size of a Prius. The tank has about 10 inches of water in it and is filled with 850 pounds of dissolved Epsom salt so when you lay back, your entire body floats up on the water. Now, while you’re in the tank, you can’t hear anything, see anything or smell anything, and because the water is the same temperature as your body, you can’t feel anything. Essentially, your body becomes irrelevant, you become immersed into the infinitude of something greater than yourself - the water. You become one with it and as you realize that oneness, a revelation emerges. Our egos are too big. We’re too self involved when the metrics that we define ourselves with don’t even require it. Success, wealth, even independence - they all hinge on a pre-requisite called “other people.” But I’m not here to tell you a sappy emotionally involved story about how people should work together. You all know the implications of teamwork; it happened in all of those group projects we’ve had every year for the past four or five years where you were either the person who did everything or the person who did nothing. I’m not here to tell you that story; I’m just here to share a few facts. Fact 1: .001 percent – the percentage of genetic variation amongst us humans. That means 99.999 percent of our genetic makeup is the same. Fact 2. A mother and a father – something we all biologically have. Fact 3. A child – something we all are. We are not that different. While our differences are good, we overvalue them. We spend so much time on our differences that we forget to invest time in what unites us. We focus on the things that make us John or Carrie or Tim. Our race, our gender, our religion, our home country, our favorite sports teams; the list perpetuates itself. These characterizations are indeed a necessary and beautiful part of us. They give us definition and purpose, an identity – one that enables us to say: “Hi, I’m David. I like cranberry juice; my favorite phrase is Hakuna Matata; and I think Prince is a great artist.” But perhaps we have spent too much of our energy valuing the attributes that make us different that we have forgotten or in some cases have never known what binds us together. Take water for instance. Water has this uncanny ability to reveal the strength of human connection and how that connection can be fostered. Water exists in three forms; a solid,a liquid, and a gas. Within each of those forms lies its true essence - the fact that it’s…water. Water adapts to its environment moving fast or slow, being still or active. Observe it: the same fluid that can nourish life can also erode rocks. Water molds itself to what is required without ever losing its ability to add value to the world around it like plants and animals and us. But we haven’t done this. We depend so much on the physicality of existence that sometimes we miss some of its most profound attributes. And it makes sense right? We trust what we can see. I can see the color of your skin, I can see your actions, I can see a very physical representation of who you are. But what I can’t see is your story. I can’t see that you were raised in Camden, your father died when you were a kid, you had to take care of your mom and older brothers by engaging in activity that may have been a little questionable legally, but all you want is a little peace of mind and happiness…and maybe to change the world. But this is what we need to see. We need to start seeing people’s stories because those are the things that make this life worth living. Those are the things that give us happiness and transform our lives into something beyond materialistic ideals. Our stories are the things that we should not only seek to cherish in ourselves but call forth from others. Let us not see others, whether they be the homeless person at 7-11 or the guy driving a Lamborghini around campus, as a static person. We are all a dynamic folding of experiences. Do not be distracted by your perceptions so much that you miss out on qualities within others that align to your purpose. Our common denominator is human. Our common denominator is that we are all human. So share a little more love, open your eyes up a little more, let go of the prejudices that have been conditioned by your upbringing. This begins and ends with gratitude. Let your gratitude for who a person is outweigh who you perceive them to be. Find out what is valid and refuse to accept what’s been deemed as truth by society. Stereotype yourself before you cast one on another. One thing that unites us all is our humanness. Embrace it. Connect with it. Foster it. Because one thing the world needs more of is more priority for our similarities. Our common struggles; our common desires to be happy. Do not let yourself be isolated to the conditions that your path has set forth for you. Rise above what has been fabricated as truth, as “I was just raised that way,” “I can’t,” or “I just don’t want to,” and construct your own existence. Construct your own existence in compassion for stronger human connections. There is no such thing as a self made man or woman – we depend on others. There is no reason to criticize before we’ve had time to understand. The future holds too great an opportunity to let it slip by because of our egos. Let’s all just be a little more like water and retain core values, but adapt our perceptions to that which yields the related value for our collective existence. 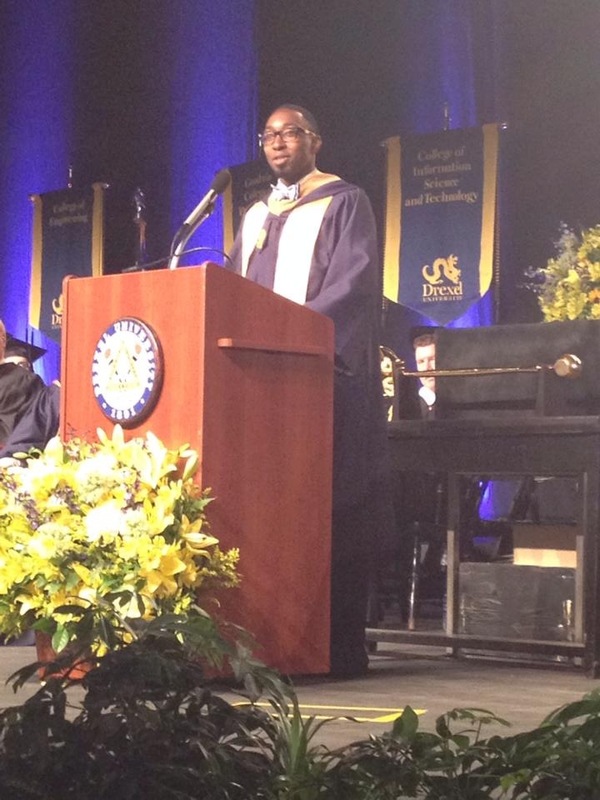 David Hunt ’14 recently graduated with a degree in finance. He and business partner Jason Browne ’14 are the founders of Spor chargers, which operates out of Drexel’s Baiada Institute. Spor is raising funds on Kickstarter through June 30, 2014.